Almost one month past since Black Friday and Christmas Holiday, most of good deals have already gone, but some stores still provide good deals, maybe the price increased a little bit, but still good deals. Here is a SD card deal, I personally think the price is good currently compare with other retail sellers. 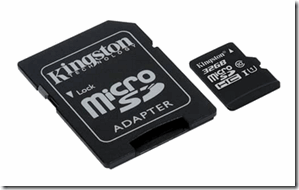 The Microsoft Store, are providing the deal of Kingston 32GB Micro SDHC Class 10 + SD Adapter for $14.99 CAD, it is the lowest price in Canada local place. You could find out similar Kingston 32GB SD card with adapter on Amazon.ca which is cheaper around $1 CAD, but those sellers are in Asia such as Taiwan, you will have to wait the item shipped from Taiwan. Also, compared with Microsoft, I am sure I would choose Microsoft Store. Microsoft to buy Skype tomorrow ?